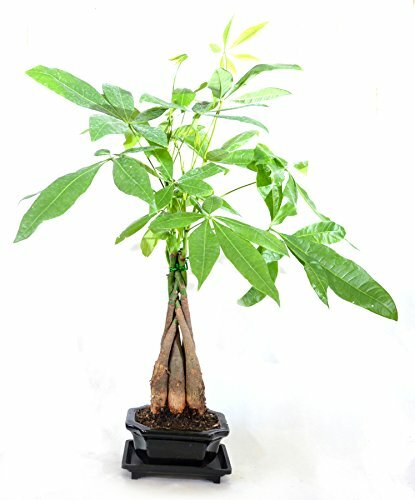 The Money Tree, or Pachira, is thought by respectable Feng Shui Masters to bring good luck and fortune to businesses and families. It is a tropical wet land tree native to Central and South American Swamps. In 1986, the popularity of these ornamental plants sky rocketed in Eastern Asia. These trees have the ability to grow up to 60 feet high in the wild. They are favorably placed as small plants in homes and offices. Popular decorative plant. PLEASE NOTE : CERAMIC POT SHAPE AND COLOR MAY VARY BASE ON INVENTORY. Brings good luck and fortune to family and business. As the tree grows, new leaves unfurl into beautiful five-leafed stems. 3x3x3'' inch pot. PLEASE NOTE : CERAMIC POT SHAPE AND COLOR MAY VARY BASE ON INVENTORY.